Water-Resistant Sorbothane® provides shock & vibration protection in any wet environment application. Water-Resistant Sorbothane® is an innovation in shock absorbing and vibration isolating materials. 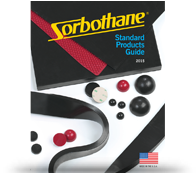 The Sorbothane, Inc. team has developed a unique formulation that makes Water-Resistant Sorbothane® impervious to moisture while maintaining Sorbothane’s impressive ability to attenuate shock and control vibration. Water-Resistant Sorbothane® provides product engineers with a superior isolator that can function in any wet environment. Download the data sheet for Water-Resistant Sorbothane® to review its material properties.